These industrial-grade HDMI extenders easily integrate into housing racks; perfect for large-scale HD extension set-ups. 8-port HDMI extender rack enhanced for signal range up to 150 feet via a single CAT5 cable. 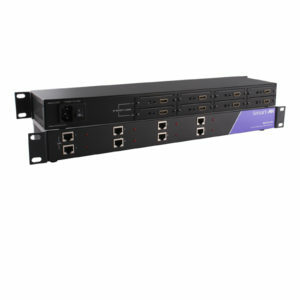 8-Port HDMI rack-mount extender that sends 1080p Full HD video & IR signals up to 500 feet via LAN. 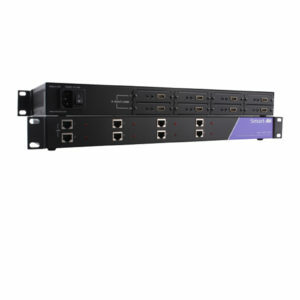 8-Port HDMI/power/IR extender rack with enhanced range up to 250 ft.